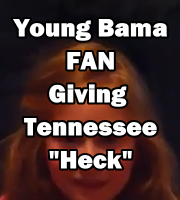 VIDEO: “G-Rated” Rammer Jammer From An Excited Young Bama Fan!!! Don't you love it when the kids can get involved in activities like Rammer Jammer? Check out this kid providing a nice alternative for post-game celebrations on the Capstone following a victory over Tennessee. How sweeeeeeeeet!